I the future I plan on buying a higher end brush. Currently I have a $25 Col. Conk which works just fine for me. As you may know I hate spending money on shaving products. Being that I have to shave everyday because of work, wetshaving has been a blessing. Easy on the face! I plan on buying a higher end brush but I only want to spend around $50. I am not cheap, but I can see spending much more on a brush. Will there be a big difference with a $50 brush and the Col. Conk I have now? i wasnt sure if i was being realistic. i was actually looking at qed and there saville row brushes. i guess i dont have much choice in the $50 range so saville row might be mt best bet. I have a Savile Row SR-25 ($60) and I am very, very happy with the brush. Ok guys I am getting serious. I think I have narrowed it down to Savile Row or Vulfix. They both have a wide range of brushes. I would appreciate and suggestions. If you are a vendor please feel free to give your advice and opinions. I would really appreciate your help. Aside from Simpson, Edwin Jagger, Kent, Plisson, Rooney, most house brands are made by vulfix. Taylor of Bond Street uses Vulfix brushes. Saville Row is actually a vulfix brush made for Charles by QEDUSA. There will be no difference in quality. Col. Conk Brushes are also made by vulfix if I am not mistaken. What brush do you have now? Are you using cream or soaps? Also if you want an interesting bit of info the edwin jagger makes a really nice brush for around where you are talking. for about 60 dollars you can get one of their medium "super" badger brushes in imitation horn which is a really nice material. I have found their brushes to work even better than my simpson brush in super badger. I think the quality is a little nicer if anything. It is my opinion that you can't go wrong with Vulfix or Savile Row. I have a Vulfix 377 and I think it's amazing. It is my understanding that Savile Row is also made by Vulfix so really you should focus on getting the best brush for your money. I would spend the extra money to get a 377 or a 2236. I'm not sure of the Savile Row model #s. I'm sure Charles from QED can help you out. I noticed he also has a great brush with a 28mm knot which is even bigger than the 377. I believe it is the SR230. 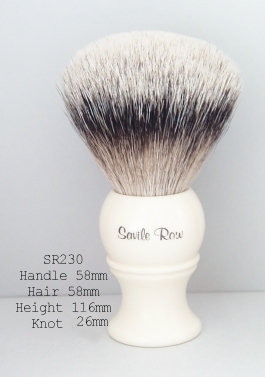 I have to agree with Vince the SR 230 looks like a fantastic basic starter brush. It looks very much like what I had in mind for my ideal brush. Not a bad idea. I must reflect on this.